(l-r) The Ancient One (Tilda Swinton) and Doctor Stephen Strange (Benedict Cumberbatch). ©2016 Marvel. All Rights Reserved. HOLLYWOOD—Benedict Cumberbatch joins the Marvel Cinematic Universe as the title character in “Doctor Strange,” in which he plays a brilliant neurosurgeon who obtains remarkable magical abilities after he embarks on a quest to heal his mind and body following an accident. 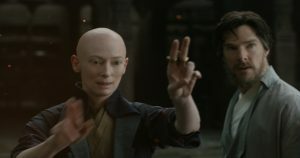 Directed and co-written by Scott Derrickson (known previously for horror films including “The Exorcism of Emily Rose” and “Deliver Us From Evil”), the fantasy adventure takes the man of science on a spiritual quest to Nepal where he learns mystic arts from a woman known only as The Ancient One (Tilda Swinton). As Stephen Strange, Cumberbatch learns to use his newfound magic powers—including the ability to alter time and travel across the globe instantly—to defend the world from troublesome former student Kaecilius (Mads Mikkelsen), who wants to deliver the world to his dark lord Dormammu. Strange is aided in his heroic effort to save the planet by Wong (Benedict Wong), the Himalayan retreat’s somber librarian and fellow student Mordo (Chiwetel Ejiofor). Derrickson and producer Kevin Feige were so certain they wanted Cumberbatch (best known for his role as a real life Nazi code-breaker Alan Turing in “The Imitation Game” as well as his role as the fictional sleuth on the TV series “Sherlock”) for their lead, they pushed back the start of production to accommodate the in-demand actor’s busy schedule. At a press day before the film’s Hollywood premiere, Cumberbatch spoke about taking on the comic book hero, working with his co-stars and whether more Strange is in his future. Q: How do you feel about the fact that the producers pushed back the film’s shooting schedule so they could get you to play Doctor Strange? Cumberbatch: I’m very glad they did. It’s incredibly flattering. It’s a weight of responsibility as well, but it’s a great motivator to try and do a good job and fulfill the promise they’ve shown in you, what they’ve given to you. I always get that phrase wrong but you know what I mean. It’s a good thing. It’s a very good place to start from. Cumberbatch: Yeah, I was sort of giddy like a child at Halloween. It was the first moment, really properly, and Alex (Byrne), our brilliant designer who’s done a few of these films, she went, “Oh you’re having the superhero moment, aren’t you?” It really a penny-drop moment for me. This film had lots alluring qualities, lots of things that made me really want to go to it. This character, in particular, and what Scott and Kevin were pitching to me as his trajectory, his origins story and where he was going to lie within the Marvel Cinematic Universe (were appealing). The journey he goes on was supremely important to me, and the qualities of drama, but also great humor amongst that profundity and that oddness and unique weirdness and newness that we were going to bring visually, so I kind of put the purer thing on the back burner. When I first had that moment, I really was quite giddy. I just kept giggling. The second time it really hit home was near the end of the main body of the shoot, when we were in New York. We were on 5th Avenue and there were as many paparazzi as there as there was crew. It was getting a little bit surreal, but we were on 5th Avenue, and running down it, and sort of jumping or skipping, really, but jumping to fly. And there was the Empire State Building in the same eye line, and it was just a moment of magic to think that the men and women that first crafted these comics had been on the floors of that building and other buildings in town. Q: Didn’t you go into a real comic book store while on location? Cumberbatch: Yes. I went into a comic book store, which was the last day shooting in New York. I didn’t have any money so I didn’t buy any comics. I offered my services. I said (to the proprietor), “If the film doesn’t work out I’ll come and stock shelves for you.” It was a magic, magic moment. No pun intended. It was very special and utterly like a lot of things in this film, very sort of not searched for. They came about for the right reasons. It really was the last place we were starting the last shot, running away from Mads and there was the comic book store. The CCTV footage probably already has been posted. 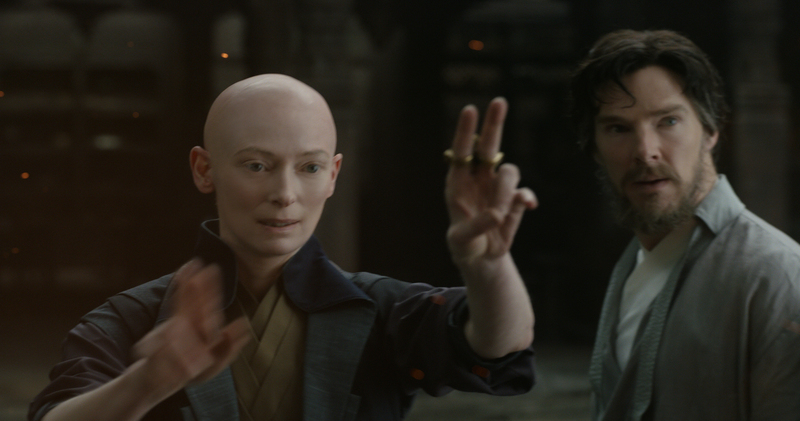 Q: Can you talk about that hand choreography you and Tilda do when you’re conjuring the magic? Cumberbatch: I get to practice in front of a mirror. She was brilliant. She was incredibly good at it. Because she was instructing Strange at the same time. There was some quite heavy dialogue going on while she was drawing a mandala, punching energy and doing delicate stuff. Q: The key to Doctor Strange, at the beginning, is his arrogance, his confidence, his feeling that he’s the smartest guy in the room and then the fall and the humbling that he goes through. Is that like playing Sherlock Holmes (his TV character) or is that completely different? Cumberbatch: I would say that’s still going on in that particular franchise. But I’d say it’s slightly different. In the Venn diagram of similarities there is the crossover of clever and arrogant, I suppose … and workaholic. But Strange is a materialist. He’s egocentric, yes. But he’s got charm and he’s witty. He’s liked by his colleagues. He’s had relationships with them. He’s not this cut-off, outsider, sociopathic, asexual obsessive that Sherlock Holmes is. So there’s a world of difference. And he lives in New York and eats bagels every night. That’s also different. He’s a man of the world, which Sherlock isn’t. 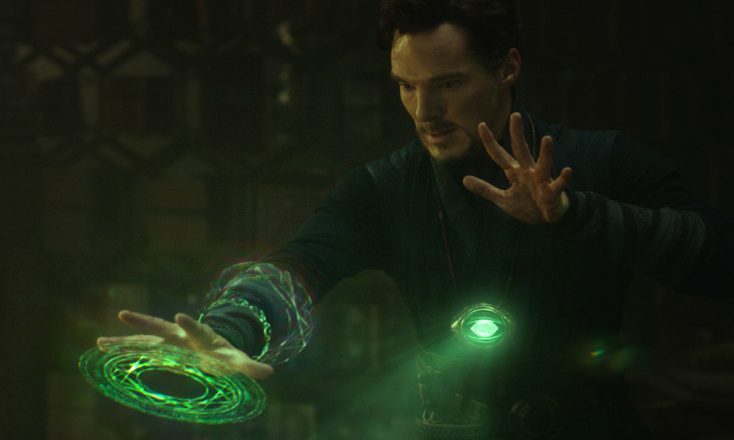 Q: In the movie Doctor Strange says to The Ancient One, “How do I get from here to there,” so who is that one person for you that you’re always striving to get to their level of expertise? Cumberbatch: Wow, I wish there was one, that would simplify my answer, but the truth is I get to work with a whole cast in almost every job, but this job, in particular, I think was extraordinary. Everyone on it was helping me raise my game, in every level. Rachel (McAdams, who plays surgeon Christine Palmer) talked about (learning to pretend to do surgery in) Scrubland, and that was a very detailed world. To watch her craft, to watch her scalpel-like precision—pun intended—with just delineating exactly what’s going on, where Christine was in that moment, just helped map out the entire world that I knew my character was shifting away from but had to be completely invested in, like the audiences at the beginning and through the duration when he crashes back into it. From Tilda treading this incredible line between being ancient and wise and yet ever youthful, as she is, and just incredibly now and present and not something old and fussy. Fusty. And just doing it with grace and charm and good nature that all of the cast of this had. Chiwetel Ejiofor, whom I’d worked with before, again to watch him construct Mordo and the complexity of his journey as well to come to fruition. This man (indicating Mads Mikkelsen) who complains he (feels like) 100 but moves like a 20-year-old with dreams of moving sometimes. He’s the most superb athlete but also the most understated and supreme gentleman who cares about you and wants to make sure that you’re not going to get hit in the face or hurt. That’s not always the case in fight scenes. To Benny (Wong, who plays the stone-faced librarian), I’ve known for a while. We’re old muckers. I adore Wong, I think the world is going to love that character and it was a masterstroke on his part. And yeah, they’re the people with whom I get to work with every day on a job like this, headed by a director, a mastermind, who both know their craft inside out, and whom you feel safe in the hands of. This can go on for a long time. I’m very lucky. I’ve worked with some very inspiring people. Q: In the Marvel “Doctor Strange” comic book, there’s an arc about the Illuminati. Kevin Feige says there are certain characters that interact with other certain characters, and some of those characters will be seen in the next “Avengers” film. Q: Do you see a correlation between this world and what was going on in the U.S. and elsewhere in the 1960s—the belief of opening your mind and opening your imagination? Cumberbatch: I would completely and utterly agree with that. It’s about mindfulness, in a sense. That’s the common derivative, which has carried through. Culturally, we’re still referencing that era. We always will. It was a very strong moment in all culture, in all pop and music. I think you have to reinvent the wheel slightly. You can’t just replicate it. This is a film for now. With your mind you have the power to change your reality. That’s a great, wonderful, freeing egoless message and also if you can do that with the idea of doing it for others, you’re onto a very, very good thing, as Doctor Strange gets to by the end of the film. Q: You’re said to be reprising Doctor Strange in 2018’s “Avengers: Infinity War.” How long do you see yourself playing him? Cumberbatch: Well, let’s get this film out first. One of the things about mindfulness is being present now and I just want to enjoy today. I really really do. We’re bringing this film to the world properly for the first time. This is the world premiere in its rightful hometown and I’m so excited about it. I haven’t seen the film yet. If I don’t have too many of these (lattes) and I get a proper nap, I’ll be glued to my seat. I can’t wait (to see it). I want to share this moment.